Synopsis: A New York cop investigates a series of brutal deaths that resemble animal attacks. Review: I hang my head in shame as I write this blog post. You see, I’m pretty ashamed that this excellent film wasn’t on my radar sooner because if it had, I’d have been able to recommend it to friends over the years. My love of horror films being what it is, I can’t for the life of me figure out how it evaded me for the past three decades. Stopping my shame spiral now, I’m here to sing the praises of Wolfen, an underrated 80’s film that’s part horror and part meditation on urban expansion. Hold up…wait a second…don’t run away…the urban expansion part fits in nicely with the thriller elements and acts as a warning much like the monster films of the 50’s and 60’s warned against the dangers of nuclear testing. 1981 saw the release of three impressive horror movies about wolves…two of which have become part of the horror lexicon since their release. 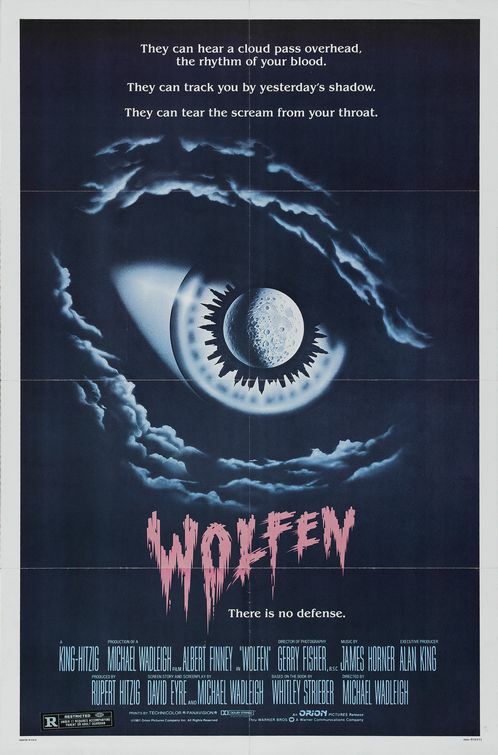 As strong a film as The Howling and An American Werewolf in London are, I was more impressed with the angle that Wolfen took in telling its tale. True, it’s easy to see why those two films are popular today among horror enthusiasts with both capitalizing on state of the art special effects and a healthy amount of gore. Wolfen may be light on outright gore but it has no shortage of tense moments and disturbing imagery. When three people are brutally slain in NYC’s Battery Park, veteran copy Dewey Wilson (Finney) is brought on the case that has high profile written all over it. He’s joined by new partner Rebecca Neff (Venora) who specializes in forensic psychology much to the amusement of Wilson. Theirs is a fairly routine relationship in that they argue a bit, laugh a bit, and eventually wind up in an embrace. Still, for 1981, Neff is a strong-willed cop…even if she’s costumed a bit too upscale at times. Hines shines as hip medical examiner Whittington that can’t figure out exactly how these murders were committed…until similar canine hairs are found on and in a growing number of victims in the city. The investigation will take Wilson, Neff, and Whittington to various desolate corners of the slums of NYC and to meetings with a group of Native Americans that may have insight into the attacks. Adapted from Whitley Strieber’s hit novel, the film can’t quite make sense of a Native American mysticism slant but it does give it one hell of an effort. Taken on its own merit, it’s an interesting take on an oft-told tale of territoriality and how far people will go to protect their land. It’s not hard to see that the novel and film are trying to show parallels between the plight of the Native American and the wolves…the thinly veiled statement comes through loud and clear but thankfully doesn’t get preachy and dilute the good will it builds. Behind the camera, it’s reported that Wolfen was troublesome. The only non-documentary film from director Wadleigh (who helmed the landmark Woodstock films), it’s a shame that the director didn’t do more feature films. If they were all crafted with the skill and dexterity of Wolfen, he may have been a director that would still be working today. The film went way over its shooting schedule, finishing up filming over a year after it began. The particular ‘wolf-vision’ technique took a while to perfect but it works like a charm in the finished product. James Horner’s note-perfect score is a character unto itself…and it’s hard to believe he was brought in as a last-minute replacement and wrote the score in 12 days. Movie-goers with good ears will easily pick out parts of the score that Horner recycled for Aliens five years later. Finney is an unusual choice for this role but he was the one the director wanted (Wadleigh flat out refused to let Dustin Hoffman have the role despite his repeated pleadings for it) and he gives the film a touch of class that it needed to elevate itself from its sister films. Wadleigh used a lot of NYC actors to complete the cast and all contribute interesting character choices – typical of stage actors making their screen debut with little screen time. With a terrific atmosphere (check out the shiver-inducing realistic details introduced in several morgue scenes), beautiful cinematography, a tense score, and skilled performances, Wolfen can’t be recommended higher if you’re looking for a werewolf movie with a little bit of class. Though it lacks the blood and guts that have made similar films Halloween staples, it’s more intriguing than any number of these films combined.